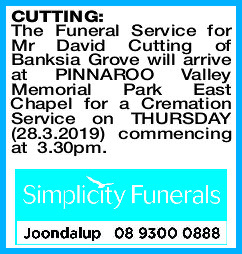 The Funeral Service for Mr David Cutting of Banksia Grove will arrive at PINNAROO Valley Memorial Park East Chapel for a Cremation Service on THURSDAY (28.3.2019) commencing at 3.30pm. 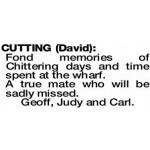 Fond memories of Chittering days and time spent at the wharf. 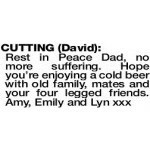 A true mate who will be sadly missed. 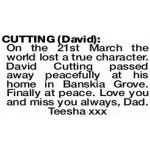 CUTTING DAVID One of a kind. 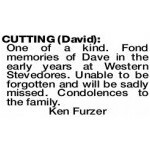 Fond memories of Dave in the early years at Western Stevedores. 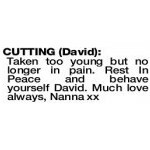 Unable to be forgotten and will be sadly missed. Condolences to the family.